When Major Maor Cohen drags in his Lego suitcase, the children’s eyes instantly light up. “The Lego Man is here!” For three years now, he has been roving from hospital to hospital. 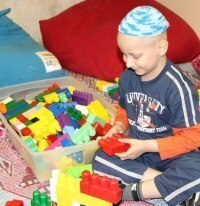 When he gets there, he gathers the children around him – many of them groaning from post-operative pains, knocked out by chemotherapy, or drained by illness – and builds Lego models with them.